“Simply Ger to Ger is exactly what it is. Facilitated trips from one family’s Ger (or Yurt, as our Russian friends call them) to another’s, lead by a local community member. Nothing has been upgraded for the tourist “experience”, and this was the closest experience to free independent travel I’ve experienced with a company. You travel like locals (or if you prefer, trek on foot along valleys and over passes accompanied by a yak drawn cart or pack-horse), and sleep in your own tent (this way you do not infringe on local’s hospitality: by tradition if you are a tent-less guest you are given the host’s beds for the night, this also helps privacy for both host and guest), and eat local food and drink prepared for you. I believe their system works very well as true “ecotourism”, you meet communities on their terms, and experience their life and their culture without any of the (often subtly) indignities of “improving” facilities and cultures for tourism purposes. I am also very interested in how they operate and, how they are funded and how you, as the tourist, pays. Firstly, they facilitate trips as opposed to lead them (most of their trips are maximum size of 6 to reduce impact on host communities), this means local transport to the “trail head” and being met by a local “fixer” who charters local transport (in our case a selection of Russian Jeep, horse to cross a river, and pick-up truck to meet our first host family. The way you pay for the trip is very clear, as this is broken down into a community fee (which goes directly to host communities), transport fee, and any national park fees etc. 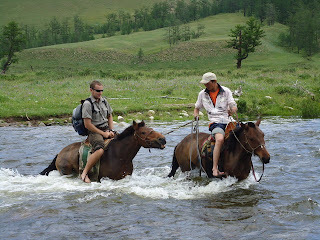 The foundation itself is funded by a compulsory pre-trip briefing at their offices in Ulaanbaatar that you must pay for. The briefing covers aspects of local culture, what to expect and how to use their language guide. Communities too have been trained in the use of the language guide which is very useful. The model seems to work well, but replicating could be challenging: Mongolian tourism is still low volume, with Ger to Ger definitely a niche market. Tourism is also highly seasonal, with only around 4 summer months of the main season. These trips may not be for everyone, but certainly the closest to the mythical “real thing” that is often touted in tourist brochures.